Rights & Democracy presents a roundtable discussion on "Turning the Tide: How We Can Build A Movement Towards a New Social Contract and a Real Democracy" with Ady Barkan, Cathy Albisa, Ana Maria Archila, Tracey Corder, Jennifer Flynn Walker, James Haslam, and moderated by Shay Totten. Given the rise of the radical right and the increasing instability in our country, pundits and business and political leaders have started to talk about the need for a new social contract. Join Rights & Democracy for this roundtable discussion exploring what kind of new social contract is being shaped by social movements and community efforts and what it will take to build a movement to ensure any new social contract gives us a true and fair democracy. Ady Barkan is a senior staffer at Center for Popular Democracy where he directs Local Progress and the Fed Up Campaign. Right before the 2016 election, he was diagnosed with ALS, or Lou Gehrig’s disease, and recently gained national media coverage for confronting the Republican Congress and Senator Jeff Flake about his support from Trump’s push to slash health care programs his family relies on so he can fund massive tax cuts for billionaires. When those cuts went through, Ady has launched a national effort called Be A Hero tour to build voter mobilization to elect Representatives and Senators who are with working families. The programs he directs at CPD are Local Progress a network of hundreds of progressive local elected elected officials across the country and Fed Up is a national campaign for full employment and a reformed Federal Reserve. Cathy Albisa is the Executive Director and Co-Founder at the National Economic & Social Rights Initiative, which is committed to a community-centered and participatory human rights approach that is locally anchored, but universal and global in its vision. She has a background in constitutional and human rights, and significant expertise in reproductive justice, corporate accountability and economic and social rights. She has published extensively and served on boards as diverse as the Center for Constitutional Rights, the National Latina Institute for Reproductive Health, the International Economic, Social and Cultural Rights Network, and the Center for Social Inclusion, among others. Ana Maria Archila is the Co-Executive Director at the Center For Popular Democracy, which she joined from their sister organization, Make the Road New York, where she served as Co-Executive Director since its formation in 2007. Before that, Ana María was the Executive Director of the Latin American Integration Center. She has led in shaping the organization’s electoral vision, organizing model, expansion to Long Island, and LGBTQ organizing work. Ana María emigrated to the U.S. from Colombia at the age of 17 and has become a leading advocate for civil rights, health care access, education equity, and immigrant rights in New York State, and nationally. 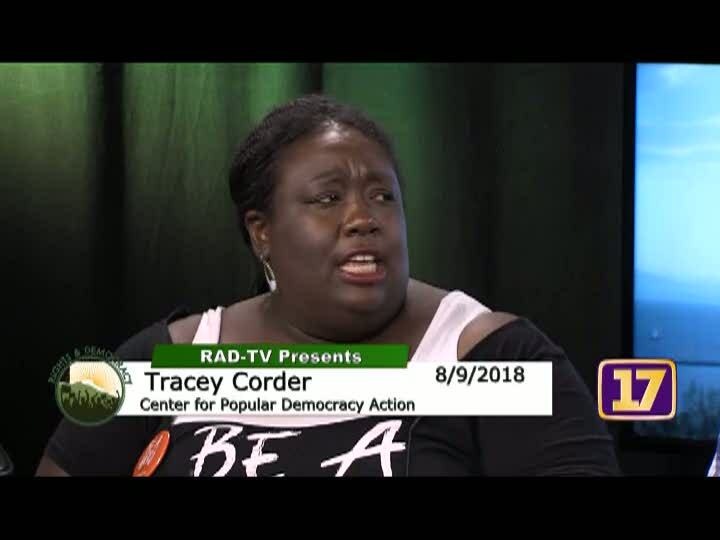 Tracey Corder serves as the Racial Justice Campaign Director for the Center For Popular Democracy (CPD), building deep and close relationships with core affiliates who are focused on driving racial justice work as well as working with other CPD staff to develop effective intersectional campaigns. She came to CPD from Oakland Rising where she worked as the Field Director. There she was responsible for developing short and long term electoral strategy and helping to sustain intentional relationships with partner organizations, elected officials, city staff, labor, community leaders and other key stakeholders in Oakland. Prior to this, Tracey worked as the Deputy Field Director for CO Victory in the 2014 federal midterms elections and served as the Wisconsin African American Vote Director for the 2012 Obama re-election campaign. Tracey has also worked to elect candidates on every level of government throughout the country. Jennifer Flynn Walker directs CPD's Mobilization and Advocacy program, working closely with the Fightback and Field Initiatives Programs. Jennifer is responsible for federal healthcare, tax policy and advocacy. At the same time, she is developing new ways to mobilize our affiliates in federal campaigns, while experimenting with innovative methods for building new and broader constituencies who can join our campaigns, including building CPD's Opioid Network. Jennifer joins CPD after serving for 10 years as a co-founder and Executive Director of CPD affiliate, VOCAL-NY. She was the director of Health GAP, a global AIDS advocacy organization, expanding the organization to 3 countries on 2 continents. Jennifer was the first US based and focused human rights activist selected for Columbia University's Human Rights Advocates Training Fellowship, a recipient of the Union Square Award, Robert Wood Johnson Community Health Leadership Award and New York City Council Hero Award and received a NYC Council proclamation in 2016 for her leadership on LGBT issues. She was named one of the most promising AIDS activists in 2001 by Poz Magazine and most was highlighted as one of the leading 25 LGBT AIDS Activists in 25 years by HIV Plus Magazine in 2009. James Haslam is the co-founder and executive director of Rights & Democracy after serving as the Executive Director at the Vermont Workers’ Center for over 15 years. He has extensive experience in running grassroots legislative advocacy campaigns, labor, and political community organizing. From 2008 - 2015, with the VWC James helped lead a grassroots organizing campaign called Healthcare Is A Human Right. He has served on a number of boards from organizations around the country including People’s Action and Resource Generation. Shay Totten (moderator) grew up in the Northeast Kingdom and as a writer and publisher has worked to give voice to people organizing on a variety of issues, from labor, LGBTQ and disability rights to the environmental justice and anti-war movements, and more. A graduate of Bennington College, he has served on the boards of the Renewable Energy Vermont Education Fund, CCTV, Vermont Press Association, the Peace & Justice Center, the Keep BT Local Coop, Burlington Friends of Education, and was a founding board member of RAD. What is a New Social Contract towards a democracy that belongs to everyone? What do we need to do in our movements to ensure the next social contract is written by and for all people in our country? For more information on RAD-TV, please visit radvt.org.